The book imagines a United States in about 50 years from now, not so united anymore after civil war breaks out between the North and South (again), this time over a law banning fossil fuels. The capital has moved from Washington D.C. to Columbus, Ohio. Mississippi, Alabama, and Georgia secede, fighting the North to still use oil and coal, while the rest of the country (and, apparently, world) forges ahead with renewable energy. South Carolina is a quarantine state. It’s not difficult to speculate on another civil war occurring in the United States, based on its current political and ideological divisiveness, with unsettling surges of violence, intolerance, and hate crimes across the country. 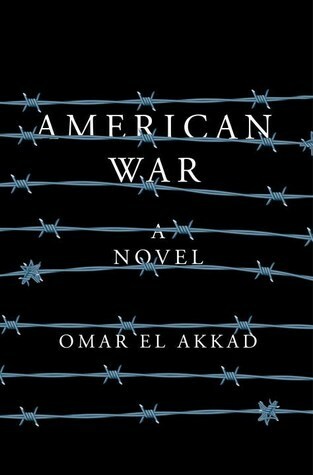 Historical issues of war such as families torn apart and living indefinitely in refugee camps, children recruited as guerrilla soldiers, cities and towns destroyed, and corrupt politicians appear in El Akkad’s vision of America’s future here, making it that much more believable. It’s pretty clear that American War serves as an allegory of the Iraq War, with climate change as the book’s catalyst. The climate change aspect is realistic and handled well, but I found it a little strange that race is only brought up in the periphery, and I can’t recall religion being mentioned at all. It’s a noticeable omission, since race and religion loom so large in American society and politics now (still). It would be reasonable to conclude that race and religion would also be factors in an American civil war taking place just a short 50 years from now. That said, I was able to suspend my disbelief and become immersed in this ruined-wasteland vision of America’s South. I’ve heard that the printed book has a few pages of maps, which I’m sorry I missed out on with the audio, but narrator Dion Graham (who also recorded the audio for the incredible Pulitzer Prize-winning 2016 book Evicted by Matthew Desmond) did a fantastic job adding dimension to the characters and dramatizing the action scenes. I really liked El Akkad’s technique of dispersing “historical documentation” with Sarat’s journey, so the reader has a change to learn about how we got to this point. American War is a fine addition the dystopian-climate change fiction genre popular right now. Listened to audiobook in April 2017. This entry was posted in books and tagged american history, audiobook, climate change, dystopia, fiction, politics, science fiction, speculative fiction, war by kristin @ my little heart melodies. Bookmark the permalink.